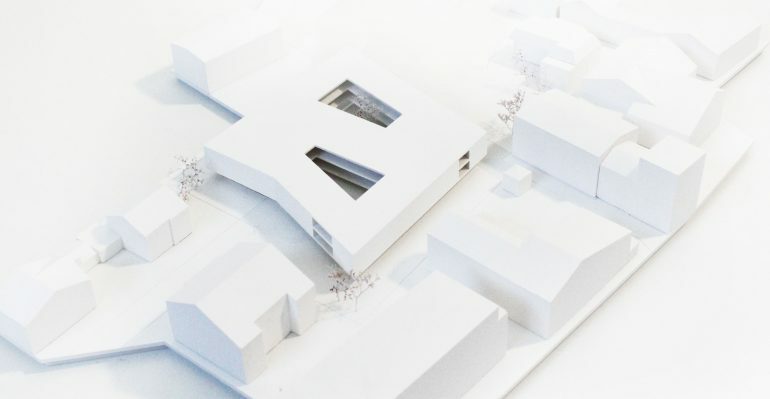 The social facility is designed by two buildings, which represent a clear functional separation between nursing home and residential care home. The ground floor connects the buildings to form one integrative unit. On the ground floor, a multifunctional public zone with high flexibility and is formed in synergy with the sophisticated outdoor areas. The result is a coherent, spacious area for meeting and communication between residents and visitors. The planning guiding principle and the internal organization of the structure result in a synergetic concept.On the one hand, the functions of the social center are spatially clearly separated and on the other hand, the connecting bridges of the buildings create a center with individual qualities in the interior and also in the outdoor space. In the care sector, the residential groups are divided around a central interior space with generous atriums, dementia gardens, the chapel and meeting zones. The internal organization invites the user to take a stroll, which ends up in one of many terraces with different orientations. On each floor, the care areas are linked to the assisted living areas, creating maximum synergies and diverse opportunities for encounters. The property is kept completely free of traffic. The development for cars, rescue transport, and pickup is provided from the south, while the infrastructural facilities (garbage, delivery kitchen, etc.) are situated north, separated from the public area. In front of the buildings, a generous open space is positioned in the southwest of the property. By integrating the playground, an intergenerational exchange takes place in the green space with a high recreational value.